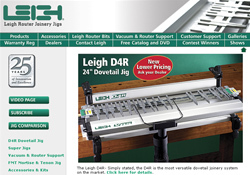 Vancouver Web Design | Vancouver Web Development - pro.NET Communications Inc.
Leigh Industries is a great example of the high quality e-commerce websites pro.NET can produce. This site features highly detailed product descriptions and a large volume of customer support documentation presented through a clean and easy to use interface. Extensive Online Catalogue with US and Canadian Pricing.